For small businesses, social media can be a valuable and very cost-effective method of marketing communications if you know how to use it. It's about involvement and brand-building, getting your name out there rather than as a direct sales tool. Compare it to being at a party. The person who stands there all evening telling everyone how amazing they are will end up talking to themselves. The other guests will get bored and wander off The person who asks questions, responds, gets involved and has interesting things to say will attract the bigger crowd. ...or all of the above. Okay, so you want to market that new line of products, for example. You need to know your target audience for that product, and try to engage with them. If you have enough staffing power to handle multiple social networking sites, that's great. If not, it's important to focus on one or two, or you could spread yourself too thin, and end up going days without activity. Your followers will notice. Would your social networking activity fall under a current employee's responsibilities, or do you need to bring on new talent? If you ever find yourself without the staffing resources to manage your page, don't stick your head in the sand, find the time to do it yourself or pay someone else to do it. You'll need to decide on the 'voice' of your social networking site. People buy from other people, not from other companies so it may be useful to pick someone to represent your business. Or do it yourself! So now you've decided WHY you are using social media, you need to work out HOW. Draw up a schedule – otherwise you'll either never use your social media accounts, or you could find yourself wasting time clicking from one link to the next! Some small businesses seem to spend all day every day posting on social media sites, which can be fantastic for their profile. However this may not always be possible for you, time is often at a premium and you've probably got a million and one other things to take care of. Using a tool like HootSuite or TweetDeck to schedule your posts. It can also help to allot yourself time for your social media, for example 20 minutes at 9am, 10 minutes at lunchtime and 10 minutes mid-afternoon. How do I use the various social media platforms? Facebook has a casual, friendly environment. It's a place people go to relax and chat with friends, so keep your tone light and friendly. It's great for sharing images so useful if you are selling products. Using Facebook for business revolves around furthering your conversation with audiences by posting industry-related articles, images, videos, etc. TIP: Make sure your business is set up as a business 'Page' and not as a person profile – Facebook have recently been shutting down profiles that have been set up incorrectly. Google+ is a Facebook competitor, and it promotes the same fun, casual atmosphere. It is the second-largest social networking site after Facebook. On Google+ you can upload and share photos, videos, links, and view all your +1s. You can also take advantage of Google+ circles, which allow you to segment your followers into smaller groups, enabling you to share information with some followers while barring others. For example, you might try creating a “super-fan” circle, and share special discounts and exclusive offers only with that group. You can also try hosting video conferences with Hangouts and experiment using the Hangout feature in creative ways. For example, if you're a hairdresser, host a how-to session on how to plait your hair. Pinterest’s image-centered platform is ideal for retail, but anyone can benefit from using Pinterest for social media purposes. To kick off, follow tweeters in your industry or related fields, and you should gain a steady stream of followers in return. Mix up your official-related tweets about specials, discounts, and news updates with some fun and quirky tweets. Always retweet when something nice is said about you, and answer people’s questions when possible. Twitter revolves around dialogue and communication, so interact as much as possible. And if you integrate your Twitter feed onto your website's home page, this will help your SEO as your home page is being constantly refreshed. LinkedIn isn't just an online CV for job hunters. It's also a powerful tool for business knowledge. LinkedIn Groups are a useful venue for entering into a professional dialogue with people in similar industries and provides a place to share content with like-minded individuals. Encourage customers or clients to give your business a recommendation on your LinkedIn profile. Recommendations make your business appear more credible and reliable for new customers. Browse the Questions section of LinkedIn; providing answers helps you get established and earns trust. Make sure you have a LinkedIn page for your business as well as for yourself. Brand it with your logo and images from your website. You can upload posts in the same way as with other social media platforms. Your LinkedIn business page even has an analytics section so you can see how many people viewed and clicked on your posts. YouTube is the number one place for creating video content, which can be an incredibly powerful social media marketing tool. Many businesses try to create video content with the aim of having their video “go viral,” but in reality those chances are pretty slim. Instead, focus on creating useful, instructive “how-to” videos. These how-to videos also have the added benefit of ranking on the video search results of Google, so don't under-estimate the power of video content! Yelp and FourSquare are great for bricks and mortar businesses. Register on these sites to claim your location, and then consider extra incentives such as check-in rewards or special discounts. Remember, these visitors will have their phones in hand so they will have access to reviews which could help to grow your business. Most importantly – don't feel that you have to use all of them! If you're a sole trader, for example, you might only have the time to use Twitter. If this is the case, stick to Twitter. 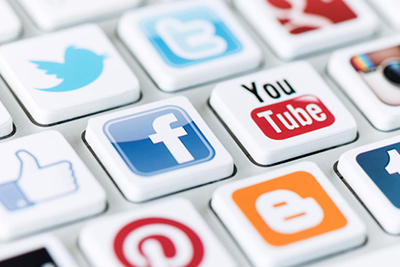 Better to have one active social media account than three or four under-used ones. It will look like you're not engaging. Some platforms are more appropriate than others. For example, an accountancy firm may not have much use for Facebook as it's so reliant on great images. On the other hand, a cake shop or photographer would fare much better with Facebook or Pinterest. And finally, despite everything we've said, sometimes no social media at all is the best decision! Have a look at the Facebook pages of David Cameron and British Gas for example. The hundreds of negative comments posted on both pages do nothing to improve their brands, and could even have a negative impact.